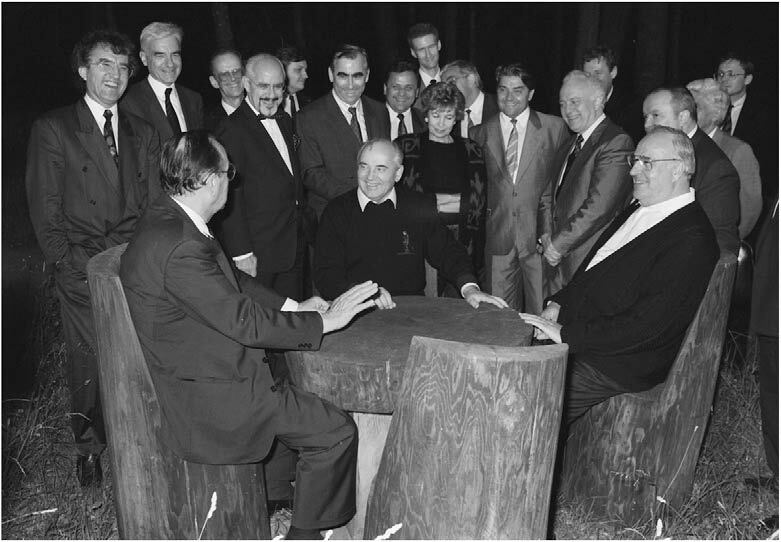 Michail Gorbachev discussing German unification with Hans-Dietrich Genscher and Helmut Kohl in Russia, July 15, 1990. Photo: Bundesbildstelle / Presseund Informationsamt der Bundesregierung. 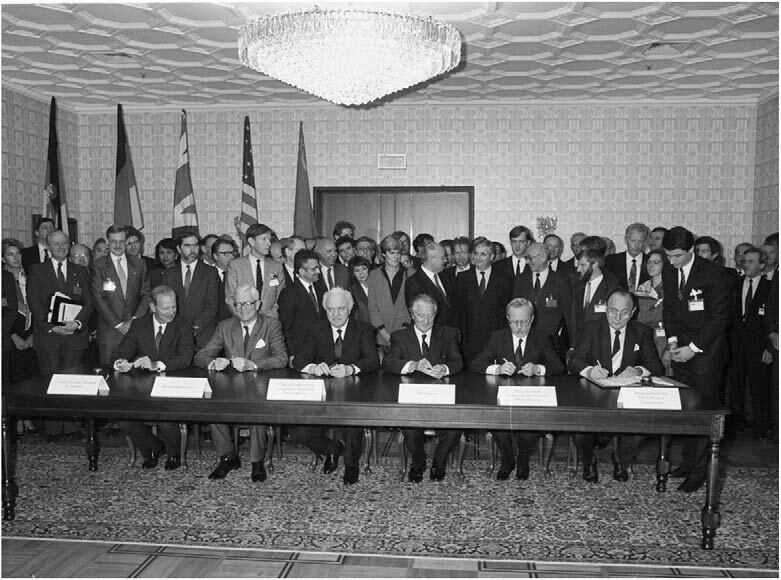 From right to left: Foreign Minister Hans-Dietrich Genscher (FRG), Minister President Lothar de Maizière (GDR), and Foreign Ministers Roland Dumas (France), Eduard Shevardnadze (USSR), Douglas Hurd (Great Britain), and James Baker (USA) sign the so-called Two Plus Four Agreement (Treaty on the Final Settlement with Respect to Germany) in Moscow on September 12, 1990. Photo: Bundesbildstelle / Presseund Informationsamt der Bundesregierung. * Svetlana Savranskaya and Tom Blanton from the National Security Archive, whose most recent book, The Last Superpower Summits: Gorbachev, Reagan, and Bush: Conversations That Ended the Cold War (CEU Press, 2016) analyzes and publishes the declassified transcripts and related documents from all of Gorbachev’s summits with U.S. presidents, including dozens of assurances about protecting the USSR’s security interests. See Chapter 6, “The Malta Summit 1989,” in Svetlana Savranskaya and Thomas Blanton, The Last Superpower Summits (CEU Press, 2016), pp. 481-569. The comment about the Wall is on p. 538. For background, context, and consequences of the Tutzing speech, see Frank Elbe, “The Diplomatic Path to Germany Unity,” Bulletin of the German Historical Institute 46 (Spring 2010), pp. 33-46. Elbe was Genscher’s chief of staff at the time. See Mark Kramer, “The Myth of a No-NATO-Enlargement Pledge to Russia,” The Washington Quarterly, April 2009, pp. 39-61. See Joshua R. Itkowitz Shifrinson, “Deal or No Deal? The End of the Cold War and the U.S. Offer to Limit NATO Expansion,” International Security, Spring 2016, Vol. 40, No. 4, pp. 7-44. See James Goldgeier, Not Whether But When: The U.S. Decision to Enlarge NATO (Brookings Institution Press, 1999); and James Goldgeier, “Promises Made, Promises Broken? What Yeltsin was told about NATO in 1993 and why it matters,” War On The Rocks, July 12, 2016. See also Svetlana Savranskaya, Thomas Blanton, and Vladislav Zubok, “Masterpieces of History”: The Peaceful End of the Cold War in Europe, 1989 (CEU Press, 2010), for extended discussion and documents on the early 1990 German unification negotiations. Genscher told Baker on February 2, 1990, that under his plan, “NATO would not extend its territorial coverage to the area of the GDR nor anywhere else in Eastern Europe.” Secretary of State to US Embassy Bonn, “Baker-Genscher Meeting February 2,” George H.W. Bush Presidential Library, NSC Kanter Files, Box CF00775, Folder “Germany-March 1990.” Cited by Joshua R. Itkowitz Shifrinson, “Deal or No Deal? The End of the Cold War and the U.S. Offer to Limit NATO Expansion,” International Security, Spring 2016, Vol. 40, No. 4, pp. 7-44. The previous version of this text said that Kohl was “caught up in a campaign finance corruption scandal that would end his political career”; however, that scandal did not erupt until 1999, after the September 1998 elections swept Kohl out of office. The authors are grateful to Prof. Dr. H.H. Jansen for the correction and his careful reading of the posting. See Andrei Grachev, Gorbachev’s Gamble (Cambridge, UK: Polity Press, 2008), pp. 157-158. 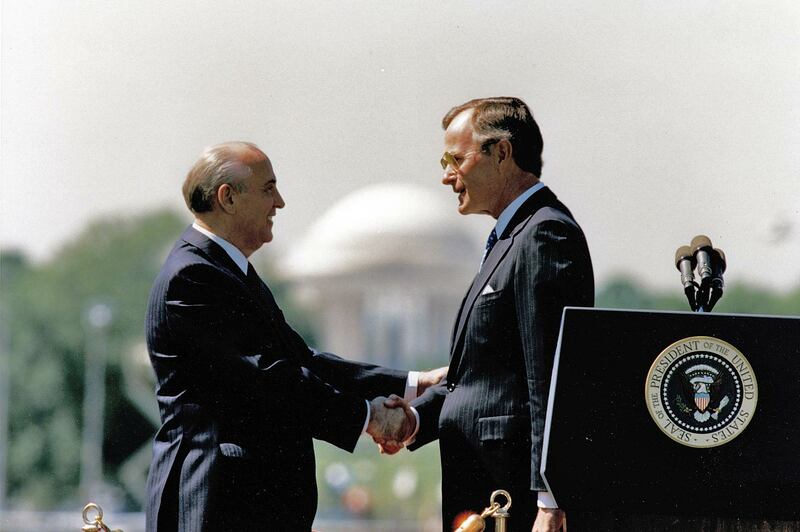 For an insightful account of Bush’s highly effective educational efforts with East European leaders including Havel – as well as allies – see Jeffrey A. Engel, When the World Seemed New: George H.W. Bush and the End of the Cold War (Houghton Mifflin Harcourt, 2017), pp. 353-359. See George H.W. Bush and Brent Scowcroft, A World Transformed (New York: Knopf, 1998), pp. 236, 243, 250. Published in English for the first time in Savranskaya and Blanton, The Last Superpower Summits (2016), pp. 664-676. Anatoly Chernyaev Diary, 1990, translated by Anna Melyakova and edited by Svetlana Savranskaya, pp. 41-42. See Michael Nelson and Barbara A. Perry, 41: Inside the Presidency of George H.W. Bush (Cornell University Press, 2014), pp. 94-95. The authors thank Josh Shifrinson for providing his copy of this document. See Rodric Braithwaite, “NATO enlargement: Assurances and misunderstandings,” European Council on Foreign Relations, Commentary, 7 July 2016.